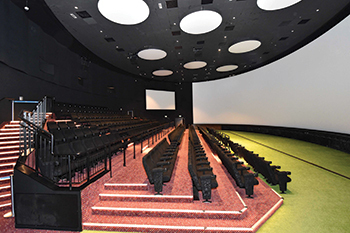 Orbi edutainment centre in Dubai ... supplied by USG Boral. Regional manufacturer USG Boral is offering world-class products that can be customised to project requirements – with the cost benefits associated with local production, says ABDULAZIZ KHATTAK. USG Boral, a renowned manufacturer of interior building finishing products, is this year launching a couple of innovations that offer high-performance acoustics, better aesthetics and virtually limitless possibilities in design. The company is also investing millions of dollars into state-of-the-art machinery that will enable it to produce panels of any size and shape for major projects that call for customisation. With regional production facilities in Dammam (Saudi Arabia), and Salalah (Oman), USG Boral has all local markets within its reach. 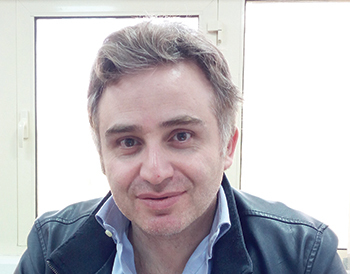 The biggest advantage of local production is cost, says Ziad Malek, deputy general manager at USG Boral Building Products. “It greatly impacts the cost of transportation and cuts lead time — crucial to contractors who want to finish work on time,” he tells Gulf Construction. While USG Boral’s Salalah plant produces gypsum boards, the company’s other product ranges – namely, ceilings, mineral-fibre suspension systems, steel framing and compounds – are manufactured at its Dammam facilities. These products can be applied to interior and exterior partitions and ceilings. First on the list here is the Easy Finish system, a new product and a definite game changer, according to Malek. Partitions used in homes are still mostly concrete; these require plastering, curing time and priming before they can be painted on. USG Boral’s Easy Finish system is a customised cement plaster replacement system that can be directly installed on concrete walls using a gypsum board panel with bonding compound, and then painted. All wires and pipes go behind the board, he explains. Ziad Malek, deputy general manager at USG Boral Building Products. Malek says with Easy Finish, large rooms can be done in less than a day. It is very cost-effective as it saves manpower and time. These innovative systems are designed to offer solutions to site finishing application and performance issues that has troubled the installers, contractors, developers and property owners. The bonding compound will be manufactured in Dammam while the gypsum panels will be locally available from the Salalah plant. In Oman, USG Boral produces its famous brand Sheetrock, a plaster board that comes in three types – regular, moisture-resistant and fire-rated (Type X and Type C). Its entire assembly of Sheetrock Type X and C with steel framing partition are UL (Underwriters Laboratories) certified. In this segment, USG is introducing Securock Glass Mat sheathing for the first time in the Gulf. Produced in the Salalah plant, this reinforced gypsum board with fibreglass facer on both sides is a high-quality, non-combustible, fire- and impact-resistant, mould- and moisture-resistant panel designed for use in properly detailed applications: for exteriors such as soffit and sheathing in cladding, exterior insulation and finishing systems (EIFS) and direct-applied exterior finishing system (DEFS), and interiors in wet areas as tile backer. Although it can be used as a roof board and a water and heat barrier, Securock panels – which comes in thicknesses of 12.7 mm and 15.9 mm - will be introduced here mainly as a wall cladding to replace the fibre cement board. Malek says that Securock will be used largely in the Gulf in exterior insulation and finishing systems (EIFS), adding that the system has proven itself in use for several years in the US. Finishing of Securock can be done with a base coat and then painted on. USG is the only manufacturer in the Middle East that offers all types of ceilings – mineral to soft fibre, fibreglass, gypsum, wood tone, and metal – produced at its facilities in Dammam Industrial City 2. In mineral fibre ceilings, USG Boral is currently focusing on specialty ceiling that combines the aesthetic monolithic look with high-performance properties in terms of acoustics and fire resistance which remains the vital elements of the mineral fibre. USG Boral has successfully increased sound absorption of its systems to reach 80-90 per cent rate. In the soft fibre range, USG Boral ceiling panels are reaching 100 per cent absorption rate with an excellent sound blocking surpassing 40 dB, says Malek. 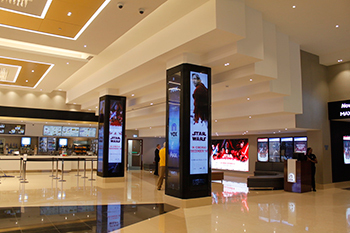 USG ceilings ... used for the cinemas at The Avenues mall. In line with its current focus on the aesthetic aspect, USG is introducing the concealed edge type ceilings in the mineral fibre and soft tile categories. These will be available from April this year. Mineral fibre systems find application in various sectors, for example, education, where acoustics is very important; healthcare, where hygiene is important; and retail, where aesthetic is a focus. Metal ceilings find application primarily in airports, healthcare, and other institutions. USG Boral is currently upgrading its plant capacity and investing in new folding machineries to address the various and unusual sizes and forms required in prestigious projects such as the Riyadh Metro. And while earlier only 60 by 60 cm and 60 by 120 cm sizes were produced, USG Boral has extended its capabilities to provide its clients with a wide range of metal ceilings, says Malek. He adds the company is acquiring the latest machines from Italy and an investment to the tune of around $3 million is being made in the ceiling business. In the wood tone range, USG is producing mineral fibre with a wood structure – mainly for aesthetics. Another product that will be soon launched is USG Boral Ensemble monolithic acoustical ceiling system that offers a seamless drywall look with true acoustical performance. Malek says that conventional gypsum boards for ceilings have no acoustic properties but with the Ensemble, USG Boral will offer gypsum boards with sound absorbance properties. USG Boral Sheetrock Ensemble panels are highly engineered to perform like acoustical ceiling panels. The panels are screw-attached to a modified drywall suspension system. The joints are finished using USG Boral Sheetrock joint compound and USG Boral Ensemble spray-applied finish as the final surface. The spray-applied finish is acoustically transparent and allows sound to pass through the perforations where it is absorbed by the USG Boral Ensemble high-NRC (noise reduction coefficient) backer panels and plenum space. All system components are designed to work together so that NRC and CAC (ceiling attenuation class) performance is maximised. USG Boral systems are tested mainly according to American (ASTM) and European standards (EN) and offer more than 330 UL-certified designs – which is unrivalled in the Middle East, the company says. Malek points out that while many companies provide certification for their products in isolation, USG Boral’s systems are tested for the whole assembly. “In other words, the integrity of the system is put to test,” he stresses. The company has supplied several mega projects in the region. It is currently supplying Jeddah Tower and Riyadh Metro in Saudi Arabia, in addition to many upcoming hospitals projects. In Bahrain, it has supplied the recently opened The Avenues mall, especially the cinemas, and the cardiac hospital in Awali. Projects in Kuwait are mostly in the healthcare sector. In Qatar, its systems have been used on the Doha Oasis project. Malek says the business environment is getting better and Saudi Arabia is expected to witness increased growth in H2 2018. The company, he says, has been receiving many inquiries and has set aside an aggressive budget for 2018. Malek says the company does not only focus on selling a product but provides technical solutions to the client as well. USG Boral is committed to after-sales and technical support, and has a dedicated department with an expert team to provide technical solutions and services. USG Boral is aiming to be on the approved vendors list of various official bodies so that local consultants, architects and contractors can easily identify its products and specify them. He points out that while international consultants and architects readily specify USG Boral products, there isn’t much awareness about its quality among local firms.